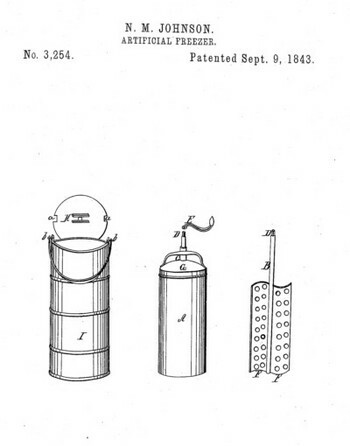 In 1843 Nancy Johnson got a patent on a machine to make ice cream by hand. This was an ingenious device that provided a real treat to everyone in the U.S., if not the world. Milk, sugar and flavoring, such as vanilla, were placed in the inner can, and a rotating paddle was placed in the milk. The inner can was placed in the outer bucket, and ice and salt were placed between the inner can and outer bucket. The salt lowered the freezing point of the ice, and contact with the inner bucket made a thin layer of milk freeze on the inside of the inner can. The rotating paddle, turned by a crank, scraped off the frozen milk, and let a new layer freeze. Sneaky adults let the kids do all the work, but it was worth it because the ice cream was so good. When enough of the milk had frozen, it became stiff, and was spooned out to eagerly awaiting kids, like me, my brother Mike, and sister Sue in the photo below, from about 1955, with our Mom and a farm cat watching. .
My mother used to makle ice-cream on sundays with this cranking machine and sell it to send us to school. Anyone have any idea on where to get information on old hand crank ice cream machines, esp. the KitchenAid brand?...Thanks in advance! ooo thanks i needed tha info for a project you rele need a put more info on the internet about ice cream makers! Thanks this web site has helped me alot on my history day report. You all need to get some more information on here though. I'm gethering date about ice cream and dessart. please link your this site.